A couple of years ago, Mom pulled out dozens and dozens of old slides from the late 1960s into about 1970. Renee and I spent all afternoon holding the slides up to a light, examining the tiny photos of our family in the past. We could hardly wait to get the prints made! I’m going to use some of these old photos (and others from my collection) in honor of “Throwback Thursday” (an Internet meme in which people post old photos on various social networks). I hope to make this a continuing series, featuring people and places that are mentioned in my book. 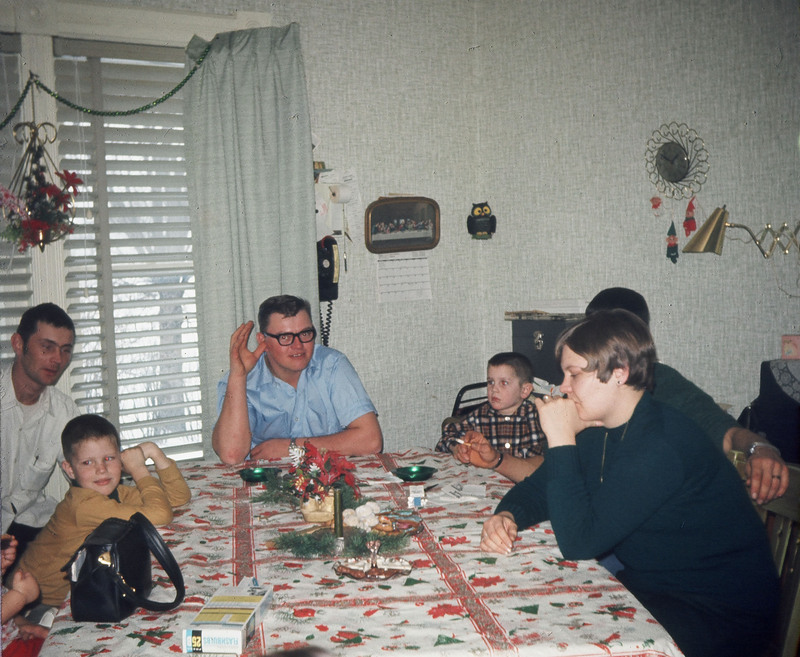 Today’s photo features (from left to right) Uncle Emmet (Margaret’s husband), cousin Vince, Dad, cousin Brad, and Aunt Linda (I think that’s Uncle Ray sitting next to Linda). I could have the boys mixed up–they are so little here and close in age! This photo was taken at Grandma and Grandpa Zimny’s house in rural Waseca. Remember the days when people just sat around and talked? No cell phones or tablets here! Notice the pack of 25 flashbulbs on the table 🙂 Of course, also notice the cigarettes and ashtrays. I’m not sure of the exact year–it’s either 1969 or 1970. The reason behind posting this photo today is because I think it’s Linda’s birthday! My 2 cents is this has to be after February 1970 because my dad has his wedding ring on. So does Mom. So December 1970? I love these old photos, studying the details (notice the clock, seemingly “in style” now, the phone, the…) and considering what story the frame tells. I have so precious few photos of me and my family when I was growing up. Yes, I remember well those days of family just sitting around the table or in the living room talking. I loved when we “got company,” when extended family would drive unexpectedly into the farmyard on a weekend evening just to visit. No one ever phoned ahead. Heck, some families (like mine for awhile) didn’t even have telephones.